Record your magical adventures with the Harry Potter Weasleys' Wizard Wheezes Hardcover Ruled Journal, a new addition to Insight Editions' best-selling line of Harry Potter hardcover journals! In one of the most memorable scenes in the Harry Potter films, Fred and George Weasley open their magical joke shop, Weasleys' Wizard Wheezes. 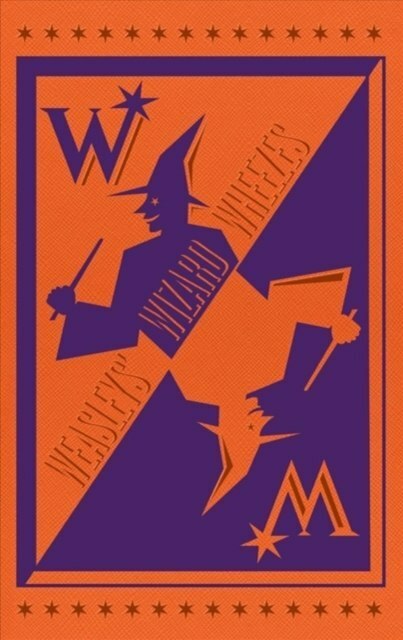 Now fans can get in on the Weasley fun with this deluxe hardcover ruled journal, based on the twins' eye-popping logo. This finely crafted journal--one of several new additions to Insight Editions' best-selling line of Harry Potter journals--displays the zany and colorful concept art created for the twins' joke shop, including some of their most outrageous products: Fanged Frisbees, Puking Pastilles, Decoy Detonators, and more! With sturdy construction and a sewn binding, this journal lies flat, and the 192 lined, acid-free pages of high-quality, heavy stock paper take both pen and pencil nicely to encourage inspiration. The journal also features a ribbon placeholder, elastic closure, and a 7.5 x 4.5-inch back pocket, ideal for holding photographs and mementos. The perfect accessory to the beloved Harry Potter films, the Harry Potter Weasleys' Wizarding Wheezes Hardcover Ruled Journal invites fans to bring a magical touch to their everyday writing.